I’m not sure how to start this report, so I guess I start at the beginning. We had three foot rollers heading out the Ayuruoca (aka The Oil Wreck). There were some high clouds and a mild breeze. The forecast called for conditions to pick up in the afternoon, but at the moment it was a nice day. Arriving at the wreck the crew tried to hook the bridge which rises up to 130 ft. The main deck is about 150 and the sand/mud is 170-180. Unable to grapple the bridge, they settled for the main deck. Mark jumped in a tied us in. Once the marker was up and all the lines in the water people began gearing up. The wreck is on the edge of the mud hole which makes the visability highly variable. It can be 5 ft or 40 ft. Today we had 20. As is usually the case it was a dark 20. Several of the divers went down to the mud bottom. They reported seeing large founder, but no lobster. I tied off my reel by the anchor and headed out along the deck in search of the bridge. The deck is littered with rope, line, and monofilament. There was also mild current pushing across the deck. Apparently I chose the wrong direction as I ran out of deck after passing one of the masts. I turned around and headed the other direction. By the time I found the bridge, I was low on bottom time, and headed back to the tie in. I could see the lights of another team in the distance as they ascended the line. I untied my reel and followed them up. There was a slight current during the deco stops. At the 80 ft stop the we were about 20 ft from the mast I passed before. The crows nest could be seen covered with lines and marine growth. There was a buzz of activity on the boat when I broke the surface. Apparently a diver in the team above me had problems and lost conscieceness as they were finishing their last stop. His buddy acted quickly and got him to the surface and over to the dive platform. The crew quickly got him on board, out of his gear, and began rendering fist aid. By the time I got on board, he was breathing O2 and slowly responding to questions. We got underway as the helo arrived. The Coast Guard crews and the Independence crew executed a text book evacuation. The helo crew was on the boat on the first try, and quickly had the diver ready for evacuation. They were quickly on his way to the hospital. From last report he is in stable condition. 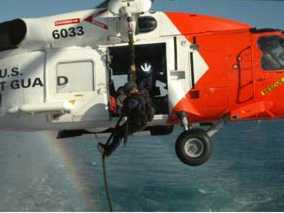 Personally, I was amazed at the response of the Coast Guard crews. Their boat crews arrived quickly to provide medical aid. While the Independence crew had this under control, not all recreational vessels are as well prepared. It is great to know these guys are that responsive. The helo crew did a professional job and made the evacuation look easy. I can not imagine trying to drop down a line from a helo onto the deck of a moving, pitching boat. These guys did a great job. The Independence Captains and crew are also to be commended for their quick action. Not only in administering first aid, but in coordianation of the events that followed. They quickly briefed the divers on the evacuation procedures, had a roll call and were making preparations. Lastly, the diver’s buddy did a great job in responding. He’s a life saver. After the early morning shock from the alarm clock, I dragged myself over to my computer to check the marine forecast. The night before NOAA was calling for 2-4 ft seas, but the NOAA data buoys were showing 6 ft. The forecast had changed overnight, and was now calling for 3-5 ft, and the buoys were still showing 6 ft. I jumped in the car expecting to be blown out at the dock. We had a full boat, and Captain Roger figured we would poke our nose out and see what the conditions were like. With a south wind, the conditions would be immediately apparent. It was a little lumpy, but not the 6 ft I was expecting. There was an underlying swell around 4 ft with some small chop on top. We agreed the conditions were acceptable, and continued our trip to the San Saba (aka Magnolia). Roger dropped the hook right next to the prop shaft about 30 ft from the boilers. A quick wrap around the shaft, and the ball was on its way. The vis was in the 20 ft range with a temperature of 50 deg at 80 ft and 53 on the surface. There was enough light to see by once your eyes adjusted. I headed off down the shaft toward the bow. Seabass were darting in and out of the wreck, and several large Tog were nibbling on the growth encrusting it. As usual Cunners were omnipresent. Some would swim right up to my mask. I was a little fearful of them nipping at my only exposed skin, my lips. After bagging a few large Seabass, and one of the larger Tog, I figured I’d just look around. By this point I was off the shaft, and running a reel which made it difficult to hold a pole spear. In several places there were piles of rusted screws which appeared to have been contained in boxes. The hardwood was still in the sand around the pile. I kept hoping they were Magnolia bars for which the wreck was nicknamed. There are several high points about the wreck with many hull plates lying in the sand. Small lobster where hiding in a few holes. One big one was seen, but found to have eggs. Several regulation size lobsters came up, but not in my bag. Back on the boat, several divers mentioned large Seabass around the boilers. They also mentioned a gill net snagged in that area. Since I did not see the boilers on the first dive, I headed that way on the second dive. There were large schools of Cunners around the top of the boiler along with several large Tog nibbling away. I didn’t see the Seabass on the boiler, or the gill net for that matter, but did find a raised deck plate with large Seabass hiding beneath. One made the mistake of poking it’s nose out and finding its way into my bag. Several others cowering inside, but I was unable to get a clear shot. When I got back onboard Captain Bob was getting ready to do his dive and pull the hook. He just took a short look around, grabbed a lobster or two, then popped the hook. Heading back the seas had calmed down a bit with indications that Sunday would be an even better dive.